Jim passed away at Northumberland Hills Hospital in Cobourg, Ontario in his 69th year surrounded by his loving wife, all 4 children, son-in-law and brother-in-law. Son of the late Dorothy Mary Jane McCrimmon and Duncan Gillies MacFarlane of New Liskeard, Ontario. Cherished husband of 40 years to Mary Louise Eckensviller, Jim also leaves behind, to mourn this devastating loss, his beloved children Katherine Anne (Hugh) Shilhan, Sarah Louise (Michael) Beaton, Heather Elizabeth MacFarlane (Greg) Krentz, and Michael James MacFarlane (Derek Carroll). He will be terribly missed by his eight adoring grandchildren: Morgan, Avery, Charlotte, Emilee, Elizabeth, Madisyn, Samantha and Jack. Predeceased by his brother Dean MacFarlane and 2 nieces, Tamara and Jennifer, Jim will also be missed by his sister, Judy (Graeme) Offer, and nieces Colleen (Stephen Welsh) Scott and Billie-Gail MacFarlane. He will be fondly remembered by many long-time friends and neighbors as well. Jim was very passionate about his work in Water/Waste Water Management and had great pride in his Scottish heritage. Jim and Mary loved to renovate and build homes and given any opportunity, would host their family and friends there. Despite his cancer diagnosis, he strongly fought this dreadful illness for 4 years, while continuing to build and complete their dream home on Lake Ontario, just outside of Cobourg. 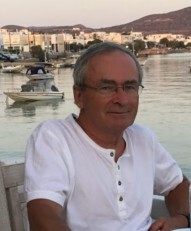 Jim was an incredibly intelligent, kind, quiet and gentle soul yet had a spark to brighten any gathering over a drink, good music and long conversations about the usual topics. As Mary would say, he had the “it” factor that made any and all adore him. Visitation will be held on Tuesday, April 16th from 6 to 8 pm at MacCoubrey Funeral Home in Cobourg. A Celebration of Life service will then be held Wednesday, April 17th at 1:30pm with a reception to follow, also at the MacCoubrey Funeral Home (30 King St. E., Cobourg). Interment at St. Michael’s Cemetery will follow at a later date. Condolences, flowers and/or Canadian Cancer Society contributions may be made through MacCoubrey Funeral Home at www.MacCoubrey.com. Tuesday, April 16 from 6 to 8 p.m.